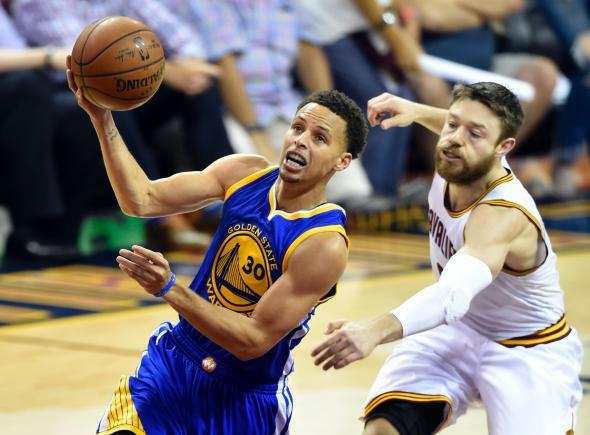 Golden State Warriors win NBA title beat Cleveland Cavs. Golden State Warriors guard Stephen Curry (30) drives to the basket against Cleveland Cavaliers guard Matthew Dellavedova during Game 6. It wasn’t easy, but the Golden State Warriors closed out the depleted Cleveland Cavaliers on Tuesday night 105-97 to win their first NBA title in 40 years. The 4-2 final tally perhaps doesn’t capture how close LeBron James was able to keep this series despite injuries to Kyrie Irving and Kevin Love. The Cavs, on the back of a virtuoso performance by James, nearly swiped the opening two games of the series on the road, losing in overtime in the opener. Returning to Cleveland for Game 3, the Cavs took a 2-1 lead and appeared capable of taking firm control of the series in Game 4, but hit a wall in the fourth quarter, when a back-and-forth game ended up as a 21-point win for the Warriors. If injuries and fatigue caught up with the Cavs at that moment, they never fully recovered. As Cleveland’s offense sputtered, Stephen Curry’s exploded after a slow start, galvanizing the high-scoring, jump-shooting Warriors offense. The Warriors took Game 5 by double digits and again were too much for the Cavs in the second half in a decisive Game 6.